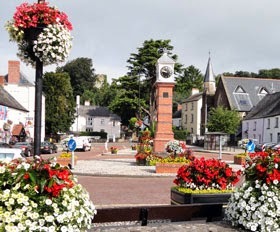 'Twyn Square' is Usk's public centre piece, an attractive arrangement of houses, shops and pubs with a Victorian clock standing proudly on an island in the middle. 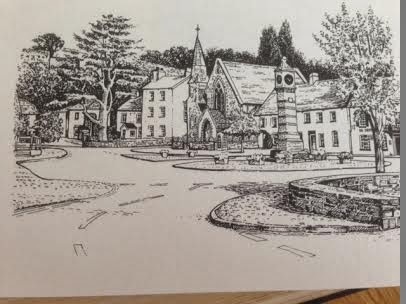 During the course of his travels around Monmouthshire in 1964, local historian, Fred Hando produced a sketch of Twyn Square and the following description of the square and the local people frequenting it. 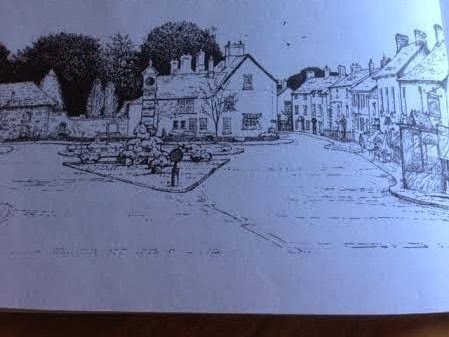 50 years on from when Fred Hando wrote this description, I think Usk has a much wider catchment area for visitors than local farms, but Twyn Square is still a central “talking place” and “rest centre” and is usually at the forefront as a “hub” for important events. 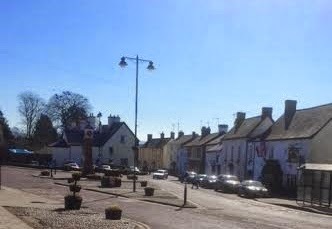 In fact, as you stand in Twyn Square today it is fascinating to think that it has probably been this 'hub' of activity for well over 800 years. 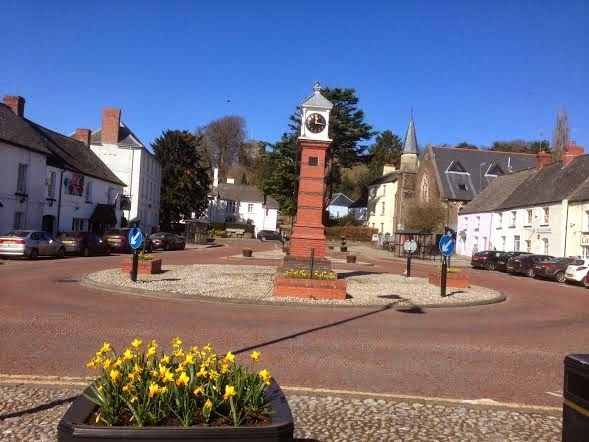 The name “Twyn” is Welsh for “hillock” or “tump”. 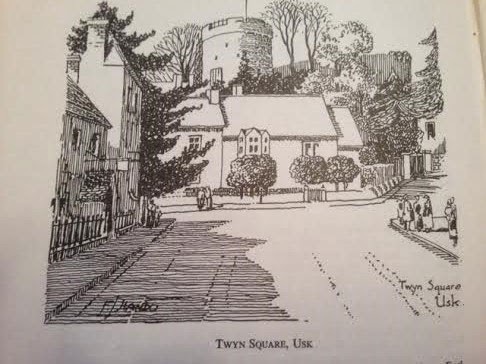 The site of Twyn Square, may well have once rested on a small hillock, but I believe the name probably refers to the adjacent small hill on which Usk Castle is built (shown in Hando's drawing) which could also have been the site of an iron age hill fort mound. 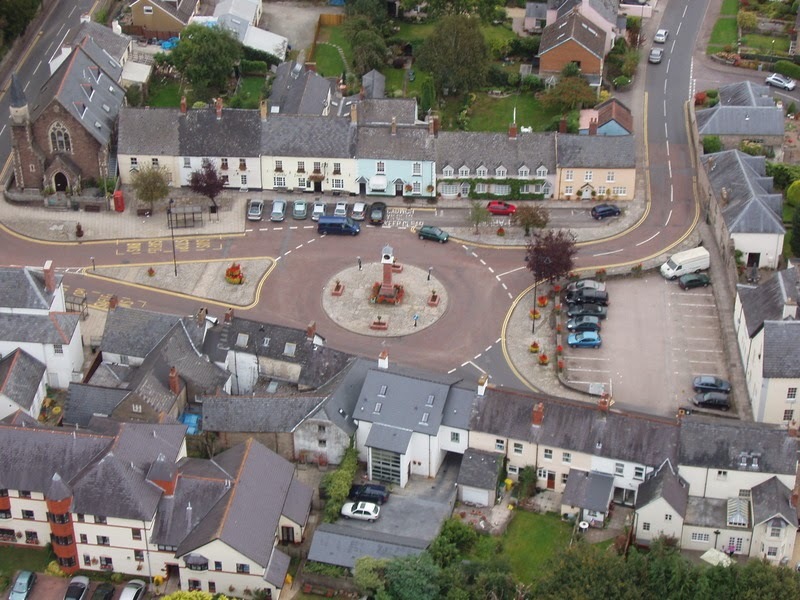 "The town was planned so as to attract trade to the town centre from neighbouring settlements by routing all the main roads through its market place, now Twyn Square but perhaps originally kown as Twyn y daley du (the hillock of the black leaves)." 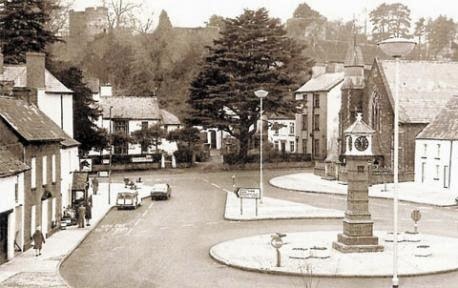 Twyn Square was used as one of Usk's market places until the early 1900's. 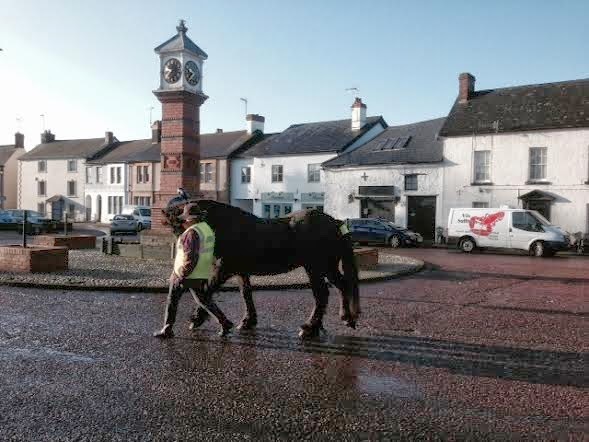 It seems that the 'market', was in fact held in various locations around the town with many of the shops and houses having metal rings or hooks inserted in their walls to allow temporary pens for livestock to be erected. 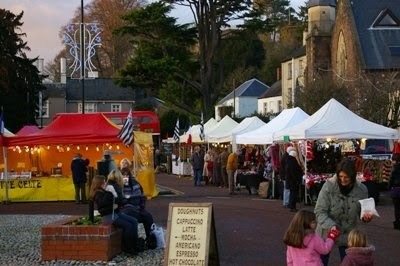 Writing in 1920, Joseph Bradney describes Twyn Square having being used as a market place and to host 'pleasure fairs'. 'All persons are commanded while the Charge is given and the Fair proclaimed by the Rev. James Barnard Davies, Portreeve of this Borough. And it is strictly given you in charge, that no person shall go armed, or carry any offensive weapon, during the time of the Fair, and that no Leather, Wollen, or Linen Cloth be sold without first being sealed with the seal of this Borough, nor Horses, without first being entered in the Toll Book, on forfeiture to the Lord of the Borough'." 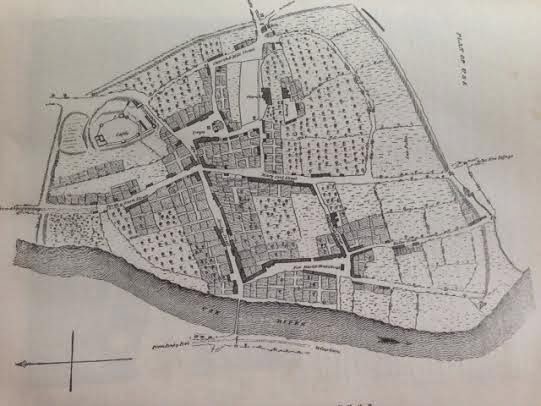 Plan of Usk showing Twyn Square, taken from Coxe's 'A Historical tour of Monmouthshire'. 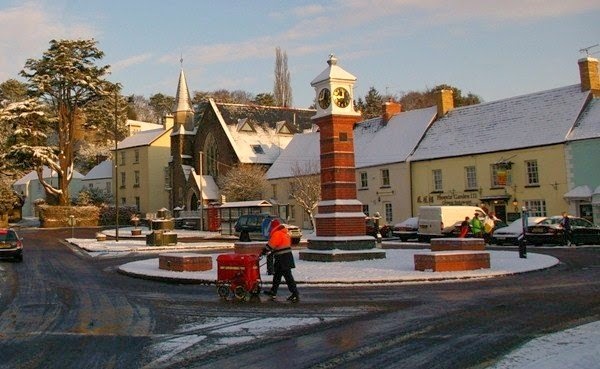 At Coxe's time of writing 1801, Usk had around 700 residents living in 165 houses. 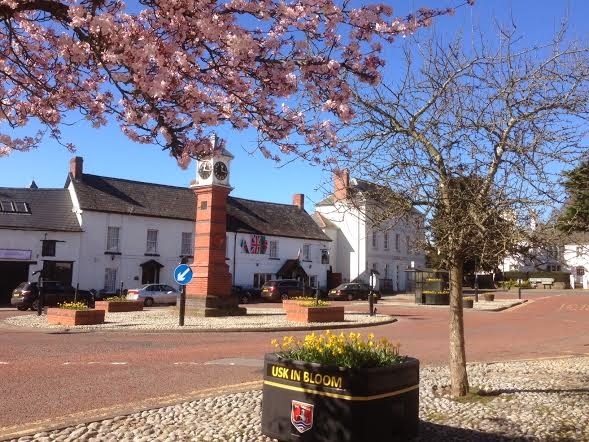 David Lewis provides a more detailed account of the properties in Twyn Square and the people residing and working in them in Victorian times, as recorded by the 1851 census enumerator for Usk, 27 year old solicitor Horace Shepard who lived in Bridge Street. 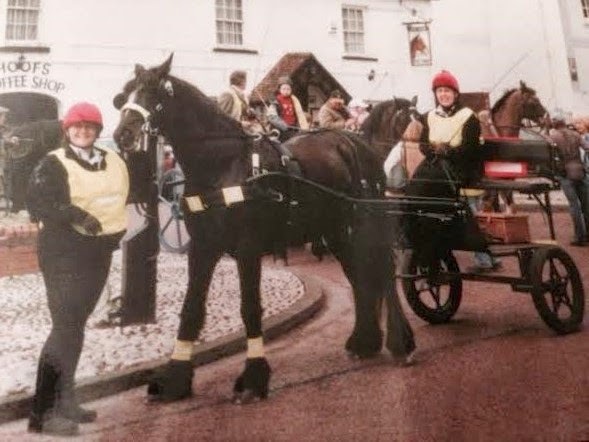 “In the house now a branch of Midland Bank (HSBC) a spinster Hannah Barnard Davies lived with her brother and servants…… Next door stood the Nags Head, a public house known earlier in the century by its Welsh equivalent Pen Cefyl. 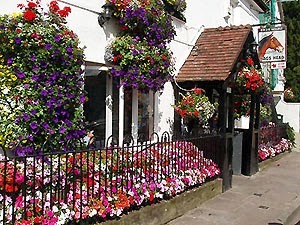 The publican here, George Morgan, lived with his wife, six children and servant, and gave his occupation as timber merchant. 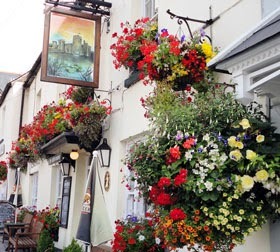 Opposite, John Williams was inn-keeper of the Castle Inn … Other householders on the Square (including those living in a block of shops and houses on the present car park site demolished in the 1960s) included a brick maker, stone mason, grocer, wheelwright, sawyer, shepherd, carrier of goods and a tiler." 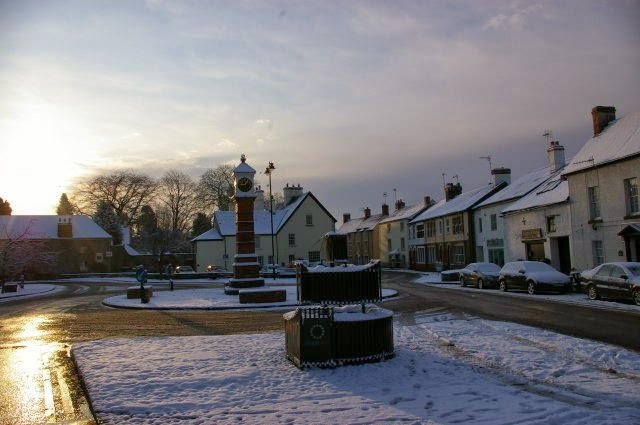 The two public houses in Twyn Square, The Castle Inn and The Nag’s Head, remain open and active today, both popular with visitors and local people. 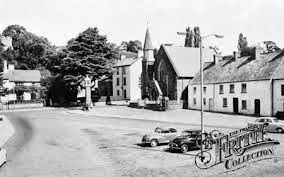 In the 1960’s when I was a small child, there was a small garage complete with petrol pumps on the Square where the new curtain shop is now and Thelma and John Morgan ran a popular gift shop on the opposite side of the Square next door to Ken Smith's Butchers Shop. We still have a butcher’s shop in these premises on the Square (now the only one in Usk, we used to have four), taken over recently by ND Lewis and Son but formerly run by Mike Phillips. 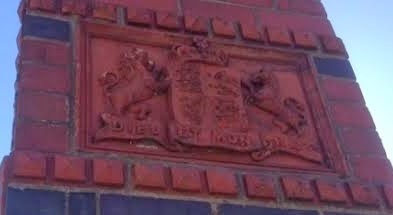 There was a small slaughter house serving some of the butcher shops in Usk, just around the corner in Four Ash Street. It closed when the introduction of more stringent European hygiene, legislation made it far more difficult for small slaughter houses to survive. There is now a private house on this site. Other commercial premises currently in the Square include 'Hoofs Coffee Shop' run by the Nag's Head, a branch of HSBC bank, an art/ photographic gallery 'Gallery on The Square' (in the old converted chapel); a florist shop, Up Market Flowers', a gift shop 'Manon' and a newly opened curtain shop and a dental surgery. 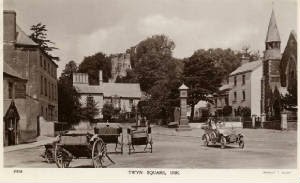 Looking towards 'Ty Brith' (the Speckled House) now called Priory House, a large house dating from Tudor times beyond the car park . 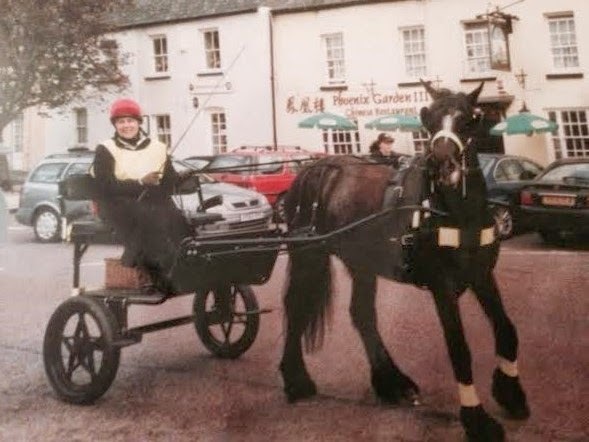 As a child I remember accompanying my Grandmother to Ty Brith to pay her rent to Sweets the builders, who built many of the houses in Usk from 1930s - 1980s. 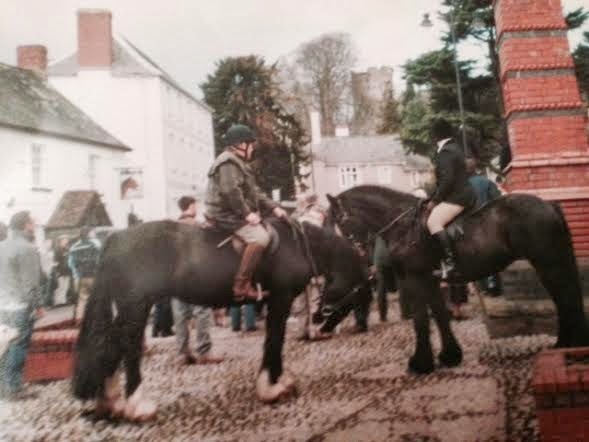 Ty Brith which has now been converted into several dwellings was a substantial property with stables, a brew house and landscaped gardens. 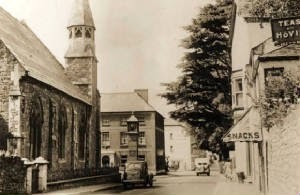 It was later used by Sweets as their offices, a health clinic and careers centre.There was a block of shops and houses in front of Ty Brith where the car park now is, that were demolished in the 1960s. The former Congregational Chapel on the edge of Twyn Square , now 'Gallery in The Square', was built in 1862, at a cost of £1,200. 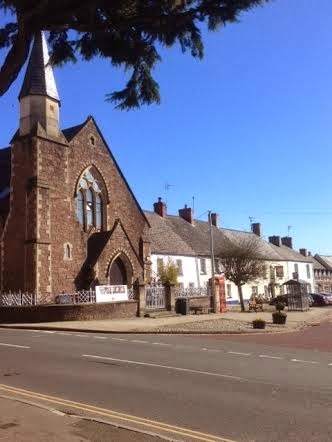 An attractive stone construction in the Gothic style with a turret which had one bell and could seat 400 people.The old red telephone box on the right of the chapel is classed as a Grade 2 listed building. 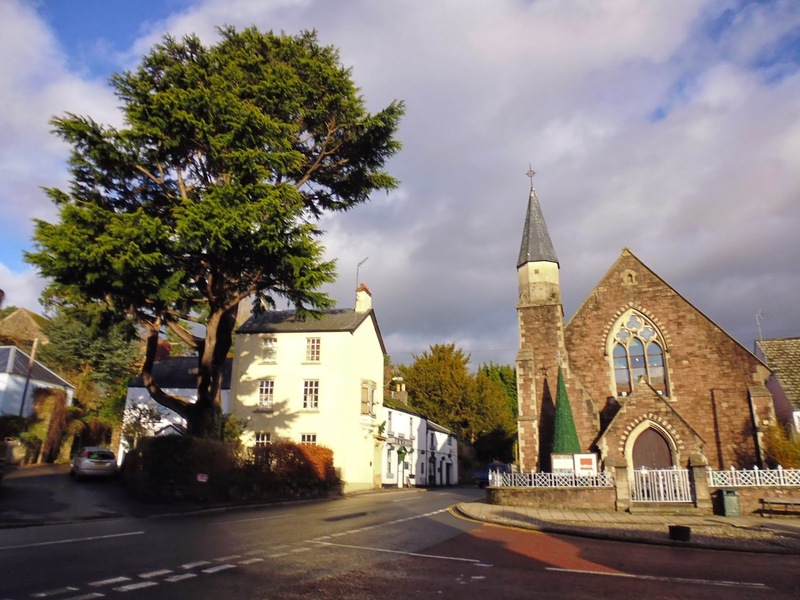 The beautiful, majestic cedar tree on the opposite side of the road was grown from seed collected by novelist and adventurer Edward John Trelawney who lived at Cefn Ila near Llanbadoc during the 1850's. Trelawney was a friend of the Romantic poets Byron and Shelley and had a reputation for having numerous mistresses and living a bohemian life style. 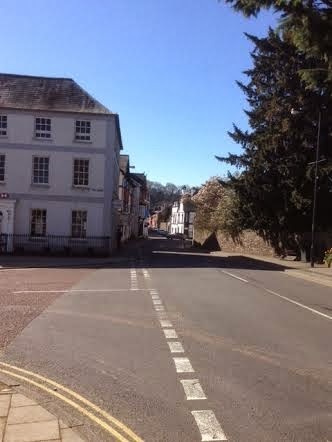 To the left of the tree is a lane which would once have been a street leading up to Usk Castle. 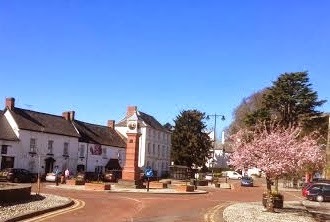 The clock in the centre of Twyn Square, was built by public subscription to commemorate the Golden Jubilee of Queen Victoria in 1887. 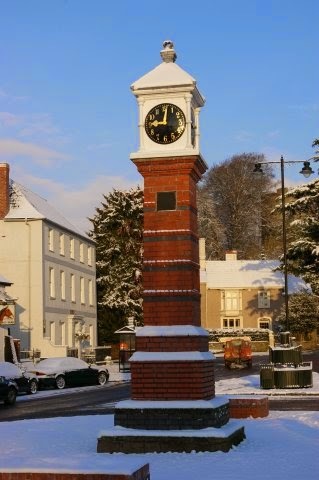 The clock originally stood on the corner of Twyn Square near the Congregational chapel. 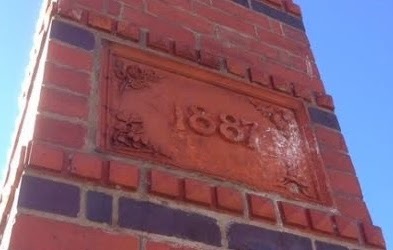 It was moved in the 1970s. 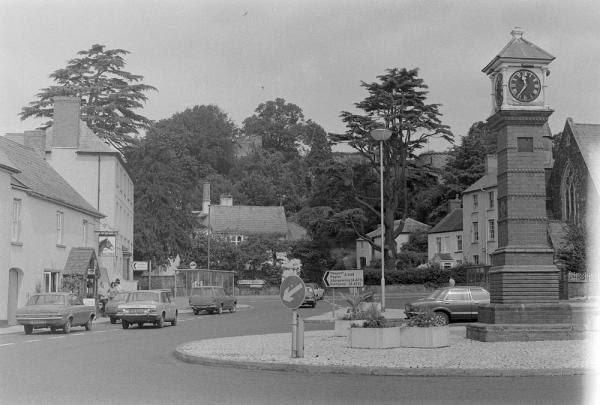 Celebrations were held in the square in 1987 to mark the clock's 100th birthday with Happy Birthday dear clock being sung. 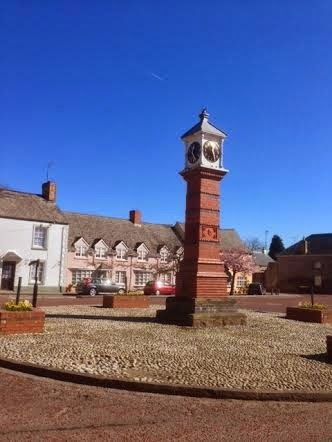 The clock is a popular gathering place to welcome in the New Year with the townspeople gathering to link hands around it to sing Auld Lang Syne! 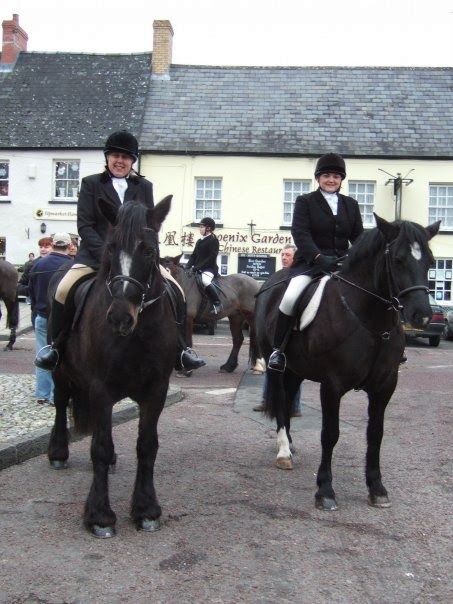 a stop off for 'refreshments' at The Nag's Head - there were about eight traps and carriages.